Digimon Universe: AppliMonsters will be one of the shows Toei will be focusing on at MIPCOM 2016. 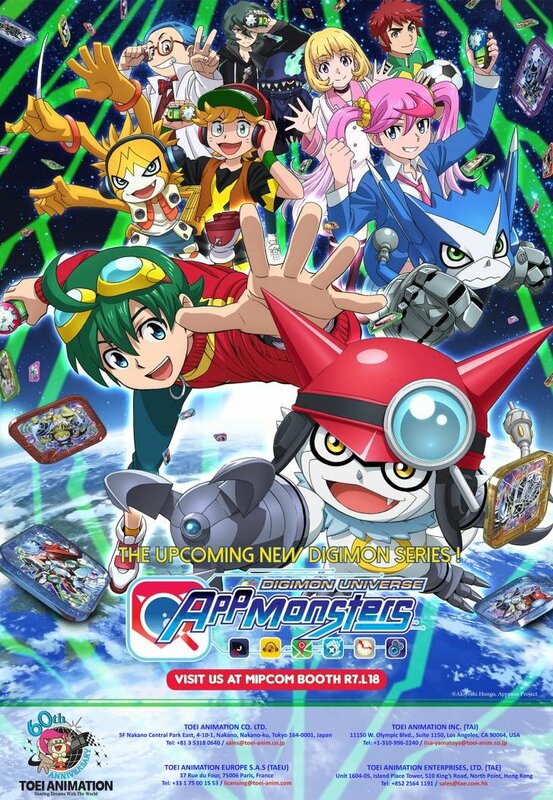 Included with the news is a promotional poster that includes an English logo with the title given as "Digimon Universe: Appmonsters" and with the title explicitly mentioned as the new Digimon series. MIPCOM is a major industry trade show in France where various companies bring their entertainment products for meetings, screenings, etc. to try and find business partners around the world. One of the primary goals of bringing a series to MIPCOM is finding companies to license it for international distribution. MIPCOM 2016 is October 17th thru 20th. Thanks to Jonathan for the heads up. Well I like the soft confirmation of a western release. But what the f-hell is that logo? It looks awkward. And "Appmonsters?" I really, really thought they'd call it "Digimon: Mobilize" because this whole "Digimon Universe" thing is strange and somewhat misleading and weirdly offbrand. There are people out there calling this series "Universe" even thought "Applimonster" is the prominent part and now... Uh. It's one thing when Savers is also Data Squad and Xros Wars is also Fusion, but then now we got Applimonster/Appmon which is also Appmonsters. Nobody, anywhere, is ever going to call this by it's correct name. I'm not someone who gets embarrassed by admitting I like certain things, but when the actual name of the thing is a mess like this... Uh. At least it doesn't have banana pants punctuation marks and mixed lower case upper case letters and is really pronounced as just a normal word. How come Toei doesnt dub Digimon Universe: AppliMonsters and Fusion Season 3 themseleves using Studiopolis? They may be for all we know. They could be trying to find distribution for the show in various countries, licensing for areas they don't want to deal with, etc. The P's in the logo really bother me, but otherwise it looks pretty nice and it's good to see they're trying to shop the show around. Hope we get this stateside one way or another soon. Victor, calling the show digimon mobilize sound kinda kiddish and stupid. I think calling it appmonsters sound great because it kinda sticking with the original concept, plus im kinda tired of company changing the name, the stroy, and the setting of the anime and dubbing into something that doesn't make any sense. For example digimon fusion, it was the worst dub the franchise ever had( really mikey, fusion fighter,Christopher, and lets not forget about pattamon). Why not keep xros wars, xros heart and digxros i think everyone can understand it even 8 year old. I was kinda worry at first when i heard that digimon adventure tri is getting dub because i was worry how different it was going to be compare to the original but im so glad that eleven arts or who ever dub it kept the original story and tone of tri, they even keep some of the Japanese music (koji wada ). I want a good digimon dub with the same story, tone as the original, and good voice actors. Why dont they make a digimon universe appli monsters youtube channel and air new episode every saturday morning that way we as fan dont have to worry about censors. I agree that no two people seem to be able to call this by the same name, lol. It is weird, however, I'm guessing that the 'Digimon Universe' prefix is so that they can continue to branch out and that we'll see other products using that title. But yeah ... that is one crappy logo. I don't know what the hell is going on there. A dub working or not is based on multiple things and not just the actual production crew doing the dubbing. I mean, the Adventure/02/Movie dub is nothing like Revenge of Diaboromon or the Savers dub despite the same director and person in charge of writing. Tamers/Frontier are considered by many people to be fantastically dubbed, and it has the same director as Fusion. Sometimes things just don't work for various reasons. As long as Saban and their crappy dubs (I'm talking mainly about Fusion of course) is not involved in this project I'm in! By the way, what happens then with Young Hunters?